D: Seit langer Zeit kämpfe ich bei meiner EME-Anlage für einen deutlich besseren Empfang. Es scheint unumgänglich zu sein, die Verluste zwischen den einzelnen Antennen so gering wie irgendwie möglich zu sein. Nachdem das Verkürzen der Kabel zum Antennenkoppler bislang nicht den gewünschten Erfolg brachte, plante ich den Umbau auf Zweidrahtleitungen. Nach viel Überlegen und Diskutieren mit anderen OMs (tnx CT1DMK, DL9KR, G3SEK etc) ist mir eine Idee gekommen, wie ich die Antennen ohne Kreuzungen und Störstellen der Leitungen speisen kann. Dabei handelt es sich um ein komplett angepaßtes System ohne Impedanztransformationen. 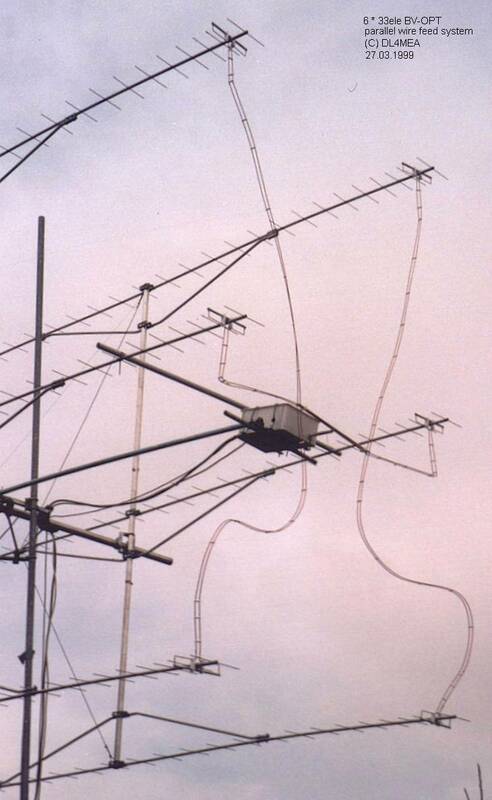 Im ARRL-EME-Kontest 1998, Teil 2, habe ich hauptsächlich gerufen, und auf dem Bildschirm von FFTDSP immer wieder viele Anrufer gesehen, aber kaum oder garnicht identifizieren können. Im selben Wochenende brach mein bisher eingesetzter Antennenkoppler und der Umbau wurde nach langem Warten auf besseres Wetter im März 1999 durchgeführt. 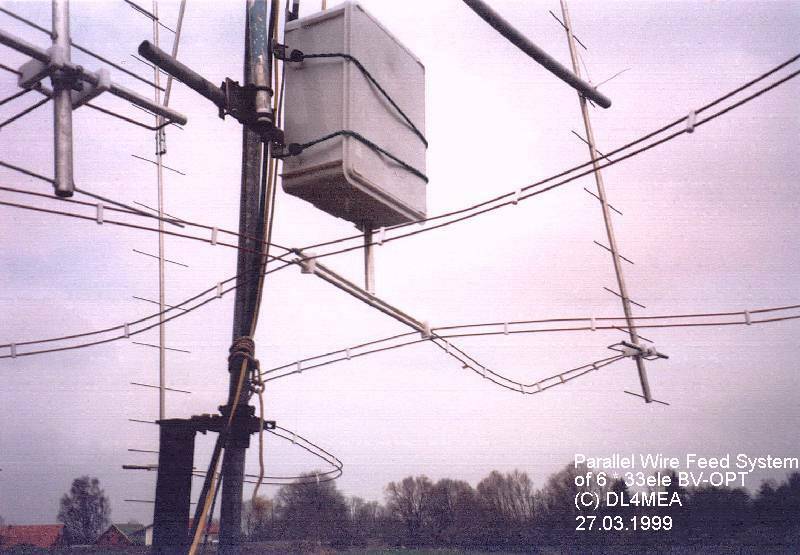 E: Since a long time I am fighting against weak receive performance at my EME antenna. 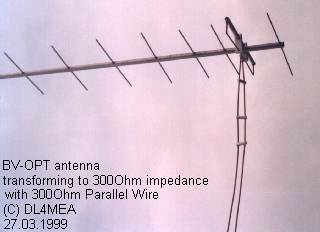 It seems to be unavoidable that the losses between the antennas and the coupler must be made as low as possible. As just shortening the cables does not give sufficient success I am planning now to modify for parallel wire feed. After long thoughts and discussions with other hams (tnx to CT1DMK, DL9KR, G3SEK and others) I found the solution how to feed the yagis without mechanical problems. Its finally a system with complete match and without any transformations. 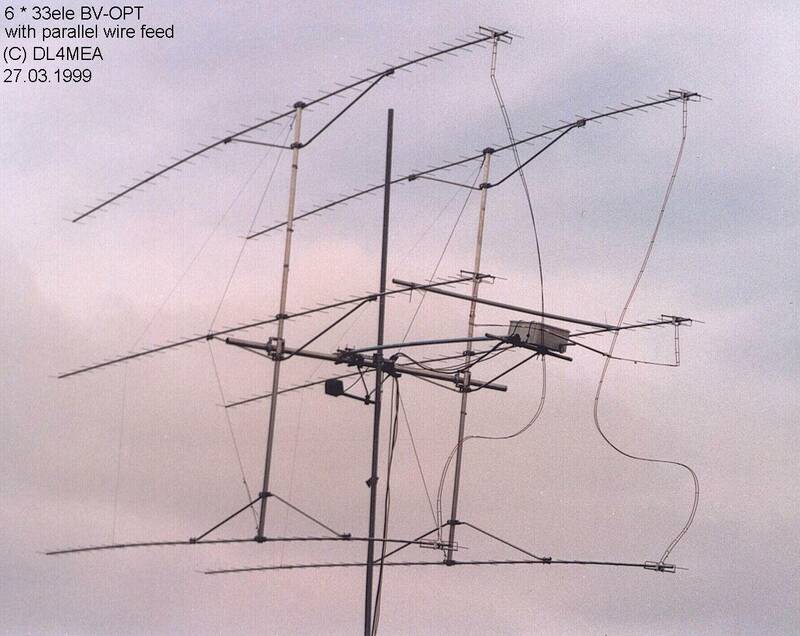 In the ARRL-EME-contest 1998 part-2 I mostly called CQ and saw many stations calling for me on the screen of FFTDSP but I copied them with great problems or even not a bit. During the same weekend my coupler broke due to cold temperatures, brass material and mechanical stress. In March 1999 I did together with the help of DC1MJK the modifications. This is simply a piece of 100Ohm impedance parallel wire. Both halfs are WL/2 so that if any misalignment of the impdance happens it does not perform any transformation anyway. The central line is simply WL/4 and implements a bazooka balun. 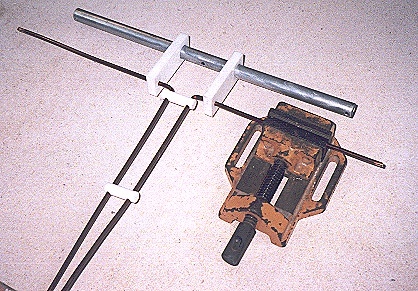 This T coupler helps to bring both connection points of each three yagis apart so that the wires don't couple into each other. 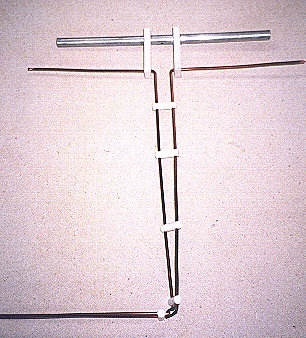 Middle antenna driven element with feedline. The teflon spacers are slipped to the bent wires and their distance is fixed. Using a hammer you can simply press the driven element into the spacers. 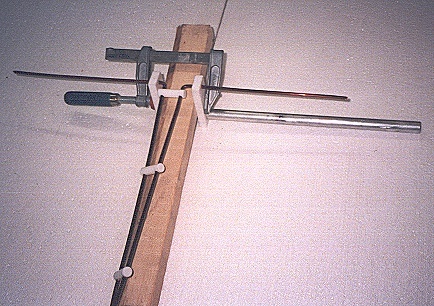 Bending of the wire using a simple drilling vice. When I calculated the new transformation of the BV-OPT to 300ohm impedance instead of the usually used 200ohm I found that this is possible using 4mm transformation lines. Nothing was closer to make the parallel wire from the same material and therewith avoid one connection completly. The feed lines are made from double varnished copper wires of 4mm diameter with teflon spacers. Both wires have 24mm distance and give 300Ohm impedance. Despite that they are already matched the length was hold to be multiples of WL/2 as already done at the T coupler to give no transformation if any misalignment happens. It was a little hard to connect the wire at the end of the elements. I put brass screws into the elements and soldered the wire there, but this is not very nice. It would have been better for any rebuilders to replace the 14mm element simply by a copper tube so you can simply solder both together. 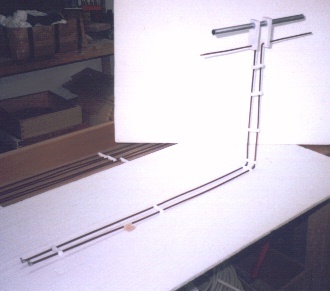 Driven element and parallel wire feed line installed at the antenna. 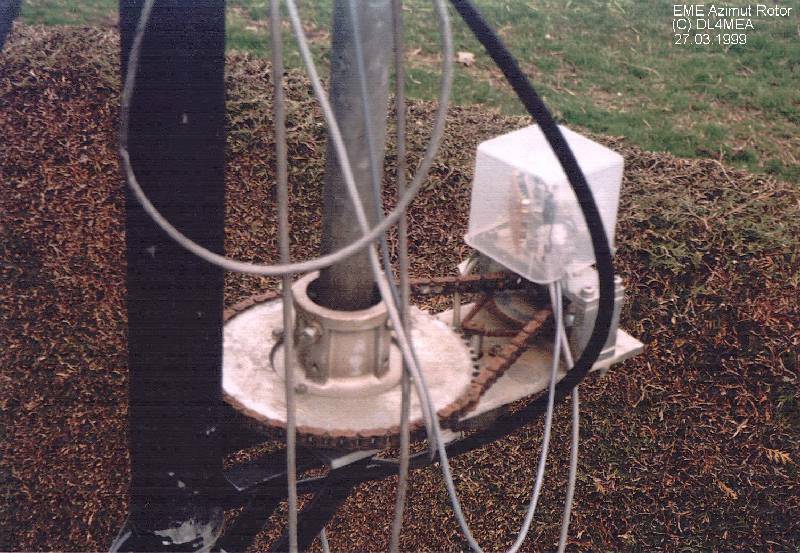 Complete antenna (also sent as QSL card for DUBUS/REF 1999 contest) Back side of the antenna Closer view to the feedline installation The box contains relay and preamp. 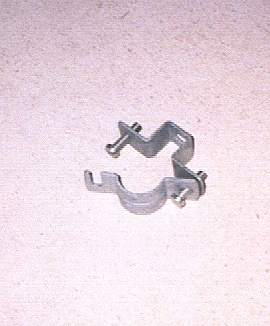 Mounting clamp for the feed elements to the boom. A screenwiper motor with a double chain wheel reduction. The box contains a ten turn precision potentiometer and a serial AD converter for azimut reading.